5 years ago, my 4 oldest daughters attended the same school. That meant I had one weekly school newsletter to read. One set of vacation dates to jot down on my calendar. One single (albeit insane) night of parent-teacher conferences to attend. But the easy life is officially over. Today I have 8 children in 8 different schools/gans/national service jobs. Up until this month I have somewhat managed this overwhelming reality. 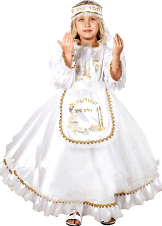 That is, until this event-filled week before Purim, when I’ve had to keep track of each child’s Purim festival, Purim dress-up day, Taanit Esther early ending time. My 19-year-old National-Service girl is even performing in her own Purim play for her students which I will be attending near Tel Aviv. Each day of this week on my calendar is filled with so many details about so many children that it’s like the Tosefot in a pocket-sized Gemara. And that means that this week my life is all about Purim Purim Purim. This morning, choosing out some 3 shekel face-paints for the kids’ costumes, I was flooded with deja vu. Of myself as a child, celebrating Purim. And I felt a gush of joy, my heart gushing with those sweet memories…Of the costumes. The caaaandy. The excitement of getting dressed up in my costume and wearing it to school…. Waaaiit a minute….That wasn’t Purim! It was Halloween!!! A bit like Purim on the outside, but completely void of any holiness or meaning whatsoever. And I thought, yet again, of my 6-year-old Tsofia’s Purim costume. Tsofia is going to be the Shabbat Queen this year. And even just writing about it now, I am getting teary-eyed. Thinking of my Halloween costumes as a kid– dressed up as Zeus or a bum or a ladybug–and I have a daughter who, out of all the costumes at the store, chose to be the Shabbat Queen. This former gung-ho Halloween celebrator merited to give birth and raise a daughter who knows who the Shabbat Queen is. And eagerly awaits her arrival Friday at sundown. And that, I think, is my own personal Purim Miracle. Every year. Continued Nachat! I’m so happy for you that your life is this way now! Such a beautiful article! Happy Purim! I always tell my kids that the non-Jews have a holiday where they dress up and go around asking for candy, and we have a holiday where we dress up and go around giving candy. They feel very proud to be Jews.